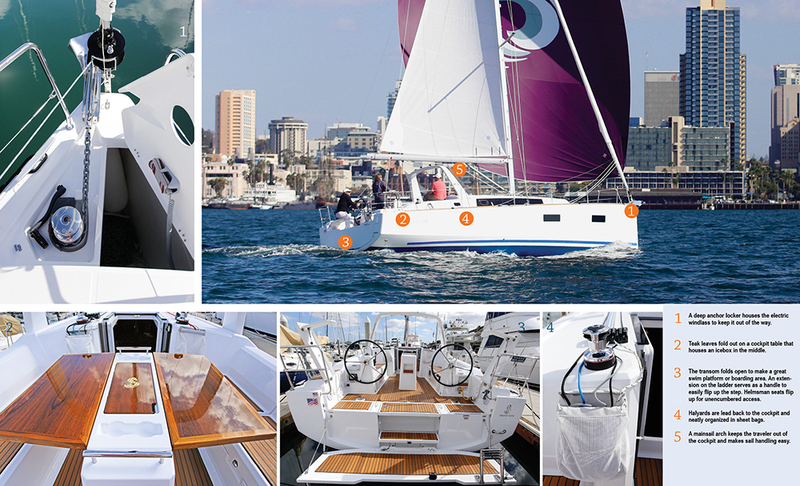 Beneteau’s Oceanis 38 comes in three versions depending on what its owners plan to do with it. Daysailer, weekender or cruiser layouts dictate the basic interior design, while the deck layout remains consistent. 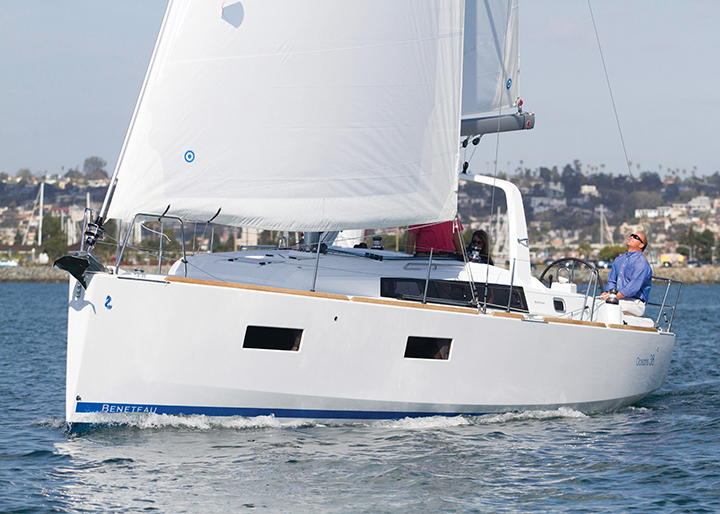 We test sailed a three-cabin weekender version—a nice compromise between the spacious but light-on-accommodations daysailer and the more conventional cruiser layout—on San Diego Bay on a glorious sun-drenched afternoon with Barrett Canfield and Rob Harring of South Coast Yachts. With breezes ranging from 8 to 13 knots and a gennaker borrowed from a Beneteau down the dock, we had a ideal day for sailing and chose to continue puttering around the bay long after we were finished testing the boat. The Oceanis 38 is typical of European-inspired designs with a nearly plumb bow and wide transom, creating a long waterline and 13-foot 1-inch beam carried far aft. The hard chines extend nearly all the way to the bow, creating a deceptively long, lean looking hull without sacrificing interior volume. Large portlights in the hull as well as a long line of windows with opening ports in the cabinhouse flood the interior with light. The hull is molded in polyester and the deck is an injected fiberglass and foam sandwich. The hull-to-deck joint is screwed and glued and then trimmed with a bulwark. Two keels are available: a deep-draft cast iron T-bulb drawing 6 feet 9 inches with 3,945 pounds of ballast and a shallow-draft keel drawing 5 feet 3 inches with 4,540 pounds of ballast. The deck-stepped mast has a compression post that tucks neatly into the table in the saloon. Made by US Spars in North Carolina, the aluminum rig rises 54 feet over the water and has a split backstay for unencumbered access through the opening transom. The test boat was outfitted with the optional furling main. The spacious cockpit has nicely angled coamings to make sitting back comfortable while sailing and perfect for lounging at anchor or at the dock. An icebox built in to the cockpit table puts cool beverages an arm’s length away and the test boat’s cockpit was trimmed in teak for a sharp look. Twin wheels leave access to the transom open, which is particularly nice since the transom flips down with an extendable handle from a stern-mounted ladder. The test boat was outfitted with everything a cruising family could want including a hot-and-cold shower on the transom, and an inflatable pool “ring” with a net to keep jellyfish out and kids in. There is even a combination passerelle and slide for Med mooring or fun at anchor. Best yet, parents won’t spend their time and breath blowing up all these toys; an air compressor is built in behind the wheel. All control lines are lead to the cockpit and the primary winches are within arm’s reach of the wheel so shorthanded or singlehanded sailing should be easy on the 38. As is becoming more common on production cruisers, the mainsheet is led to an arch, freeing up space in the cockpit that would have otherwise been taken up by a traveler. Although there is little need to go forward while sailing, sturdy handholds on the cabinhouse and wide side decks would make it a safe proposition. Binnacles at each wheel house compasses and B&G touchscreen plotters are mounted at each station, although the throttle is only at the port wheel. There are storage compartments aft of the wheels in the cockpit sole with a life raft compartment and room for additional gear. The amount of lazarette space is dictated by the interior layout, but in our three-cabin weekender test boat, the starboard lazarette easily held the swimming pool, extra PFDs, seat cushions, tools and more. Two-cabin versions will have larger lazarettes. A large anchor locker with an electric windlass should make anchoring especially easy.